Join the discussion on our forums! Come discuss Vilespine Slayer over in our dedicated Vilespine Slayer discussion topic. Does anybody else love the sound this card makes? Back when this card was first revealed, I said that HearthArena would rate this over 130. Never thought this card was *bad* but after having it wreck me left and right I certainly think I underrated it before. Except that there's a big difference between 'Destroy a minion' and 'Destroy a minion with 7 or more Attack.' That one extra condition for BGH is significant, because it lacks coverage for a myriad of threats: Ysera, Infernals, Tirion, to name a few. It's similar to why 4-Attack minions are the bane of Priests' conditional removal. 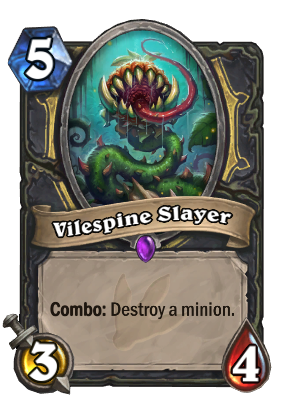 Vilespine doesn't have this problem, and can be used to either remove large threats, or simply gain tempo by killing a 5/5 or 6/6. The reason BGH isn't being run is because it's too situational and clunky a tech card. Even before its nerf, BGH was a card that tended to end up being a dead card in hand for most of the game. In the past, I've played successful decks which deliberately avoided playing 7-Attack minions, making the opponent hold onto BGH for a large threat that was never coming. I don't get the hype. This card is about the same as big game hunter which nobody plays. This card will not see play. this guy obviously is really, really bad at hearthstone. Blizzard sure loves giving Rogue 5 mana cost cards. I think its good but 5 mana with a combo it must hit a good target we all remeber shado-pan rider 5 mana combo wasn't as easy to trigger as we thought. Welp. It's a green leafy X shaped slice. That good enough? i wanted that to happen too but big X with green theme of plants is great too!